Los Angeles has so many murals, you could spend a week searching out the collection of more than 1,500 throughout the city. Luckily, three clusters of murals exist along the Metro Rail Red Line in three separate neighborhoods: NoHo Arts District, Hollywood and Downtown. Begin your tour in the NoHo Arts District, an up-and-coming area in North Hollywood known for its eclectic mix of food, art and more than 20 small theaters. Throughout the main district, you can find small community murals, such as the collage of alley paintings next to Pit Fire Pizza Company and Independent Coffee & Tea. Continuing west on Magnolia Ave., hang a right on Bakman Ave., where a few murals can be seen at Lankershim Elementary School and across the street at the church playground. A five-minute walk down Chandler Blvd. from the NoHo Red Line station will take you to the Chandler Outdoor Gallery, a collection of murals along a Class I bike path. This half-mile stretch between Vineland Ave. and Cahuenga Blvd. 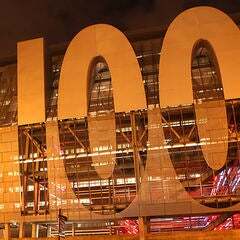 is home to 19 murals. Along the path, look for an opening to a side street where both sides are surrounded by the 100,000-square-foot furniture store, Arte de Mexico. With an endless supply of high-end international furniture, décor, statues and rugs, you could get lost in this maze-like store. Take the Red Line from the NoHo Station to the Hollywood/Vine station. Here in the Hollywood Entertainment District, celebrity-themed murals reign. During the day, you will find a few movie star portraits on metal doors of closed shops. At night, more of these are visible as the clubs and bars open up and the day shops close. One block north of Hollywood Blvd. at 1750 N. Vine St. is the famed Capitol Records Building, home to the mural Hollywood Jazz 1945–1972. 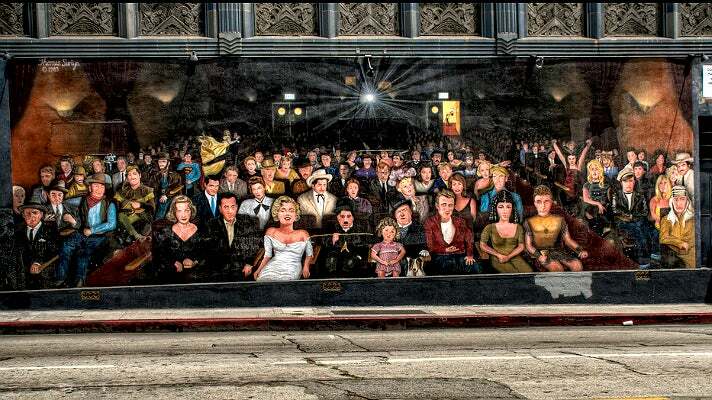 Head west on Hollywood Blvd., and just south on Wilcox Ave. is Thomas Suriya's You Are the Star, which features dozens of film legends sitting in a darkened movie theater, looking straight at the viewer. "You are the star," indeed. One block west is Dolores del Rio, located north of Hollywood Blvd. on Hudson Ave. 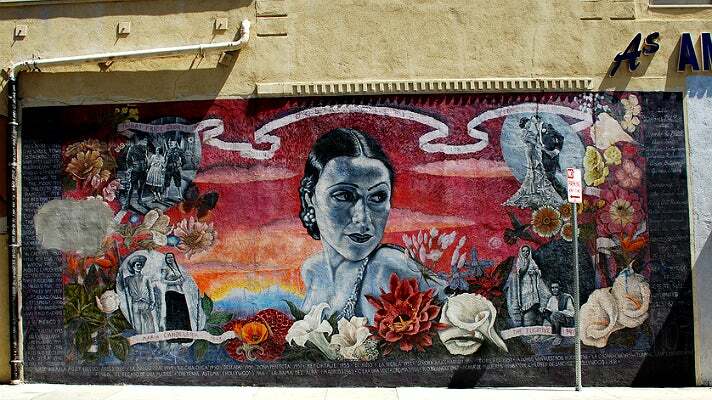 The mural, painted by Alfredo de Batuc in 1990, is a tribute to one of Hollywood's first Latina film stars. Traditional meals and classic Hollywood environs can be found at Musso & Frank Grill, Micelli's or Pig 'n Whistle, while newer and hipper places include Wood & Vine and Lucky Devils. Various cheap and quick pizza joints line the Boulevard along with the popular Skooby's, a small hot dog stand. Save dessert for the other end of Hollywood Blvd., home to three acclaimed ice cream establishments: Gelato Paradiso, Mashti Malones and the Disney Soda Fountain. Next to Disney, stop by the El Capitan Theatre for the Art Deco interior and trompe l’oeil mural over the concession stand. 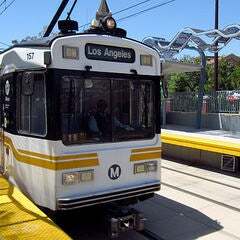 Get back on the subway at the Hollywood/Highland Metro stop and take the train to Union Station. From the platform, exit at Vignes St., which will put you in the East Lobby, where you will see City of Dreams, River of History over the gateway of the platform corridor. Walk down the corridor and exit the building at Alameda St. Across the street is El Pueblo Historical Monument, home to the controversial Americana Tropical by David Alfaro Siqueiros. One street over at Spring St., head toward the Downtown area. From the 101 Freeway bridge, more murals can be seen: Galileo, Jupiter and Apollo. Walk north on Spring St. past City Hall and the Los Angeles Times Building (note the relief mural on their parking garage) into Gallery Row, where California Dreamscape is found in the lobby of the Ronald Reagan State Office Building. Take a right on Third St., heading toward Broadway. 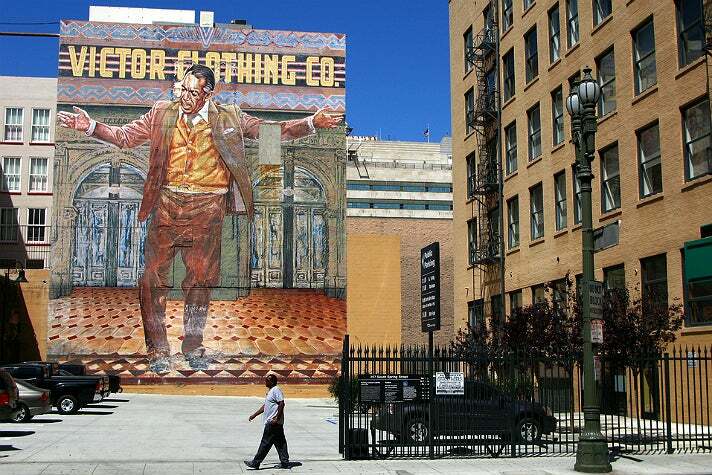 At 242 S. Broadway is the Victor Clothing Company, home to ten exterior and interior murals. At 317 S. Broadway, walk through Grand Central Market and take a left on Hill St. At the corner of Hill and Fourth sts., look up to see a clever trompe l’oeil of workers on scaffolds. Continuing down Hill to Fifth St., take a right and go to the Los Angeles Central Public Library's Children’s Literature Department, where eight 1929 murals show some of California’s history. In the rotunda, additional murals depict more historical scenes. 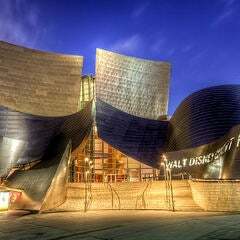 Go down Grand Ave. past MOCA and Walt Disney Concert Hall and take a right on First St. to the Civic Center Metro station. There, ending your day, you will see Under the Living Rock, a 160-foot mosaic mural made of Venetian glass.